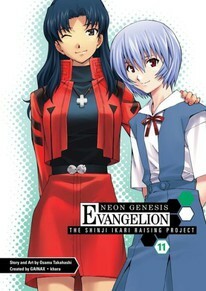 The most famous anime/manga franchise of the last 20 years, Neon Genesis Evangelion has aired in the US on Adult Swim. Of all the unbelievable things that have happened in The Shinji Ikari Raising Project, perhaps the most shocking is that Yui has finally managed to dig Kyoko out from her laboratory to join the crew on a forest retreat! Asuka and Shinji are bound to get close by accident, but wait - are they actually getting closer? Then it's back to target training for the students but this time the arena is their school, and the targets are shooting back!